Lucky is a pit bull mix who has been at the Humane Society of Skagit Valley for a few months now. He showers me with kisses every time I walk him, and he would be a great addition to any home. Luck has a lot to do with pet adoption. Which shelter a dog winds up in. What color his fur is. What breed he is. Lucky is more brown than black, but his pit bull appearance may have slowed his adoption chances. Looking at the markings on his face, seeing the lighter brown circle around his mouth… might he be part rottweiler? Might that improve his chance of adoption? It should be enough that he’s lovable, well-mannered and knows how to walk on a leash. Tell your friends about Lucky and let’s find him a home. 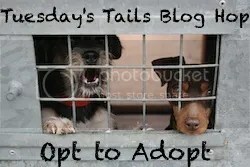 The Tuesday’s Tails blog hop is hosted by Dogs N Pawz and Talking Dogs. This blog hop features shelter pets. Find a pet at your local animal shelter or rescue and join us! ← K is for Knock! Knock! Lucky sure is handsome! It is so great you visit him on a weekly basis. I am sure he appreciates it. Hopefully he finds the perfect home soon. Lucky is such a cute boy! Sharing. Lucky is so cute! I hope he finds a home soon! My boyfriend keeps telling me that we have enough dogs. I respond that he has enough cars and tractors – we disagree. I have eye on a young, female pit bull mix that is so sweet. I won’t bring her home, because we do have enough dogs, but boy would I like to. I was always taken aback by people that were afraid of Tynan. He was black and had a square head which I later learned makes dogs scary to people… weird people! I guess Tynan and I were lucky to find each other (he was in the shelter for almost a year.) Hopefully Lucky won;t have to wait that long for his lucky love at first sigh moment with his forever human. He is such a cutie! I love those square heads!! They’re so kissable!! I hope Lucky gets adopted soon. He looks pleasant enough. Lucky is a beautiful boy and I hope he gets his forever family real soon! Lucky is gorgeous! Sharing and hoping he finds a forever home soon. Lucky is a stunning looking boy, hope he finds a loving home soon.